« Dufay dioptichrome or Lumiere autochrome? World War 1 photography. Now that might be an unusual title for a photography blog but bear with me! Every year my Christmas rush for school, pre-school and nursery pictures starts at the beginning of September. That’s a long time to be exposed on a daily basis to all the bugs and germs that children share freely at school and I go to about 20 different schools during that time! 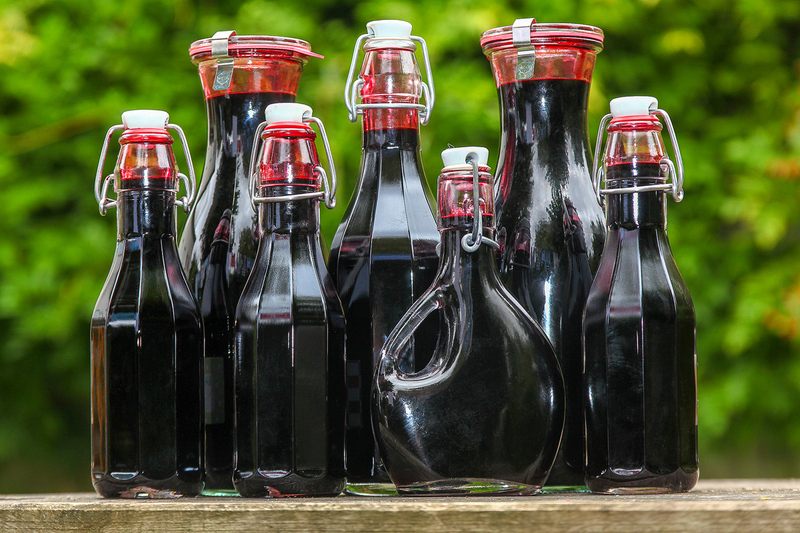 A few years ago I made some elderberry and rose-hip syrup from fruit I foraged from the hedgerows around my village. I had a good glug of each with my breakfast each morning and that year I barely had any coughs or colds for the entire winter. Now it might have been a coincidence but I’m sure that the vitamins and fruity goodness in those syrups helped bolster my immune system and powered me through a time of year when I cannot afford to operate at reduced speed because of a cold. Given that we all hate catching a cold I thought I’d just post up the recipe I follow for making it and maybe it’ll help you too. The rose hips around me aren’t quite ready to process yet so I’ll start with the elderberry syrup as those juicy black berries and ripe and ready to go right now and are really easy to find and pick. A lot of recipes will give you specific amounts of things to use like you would get in normal cooking but I’ve found that you can be a bit more cavalier about this and basically make it to suit your own taste – here goes. Large bowl or two depending on amount of berries to be processed. Muslin cloth and elastic band – one for each bowl you use for draining. Sugar – amount varies depending on desired sweetness level. Small funnel for help getting the juicy goodness in to the bottles. 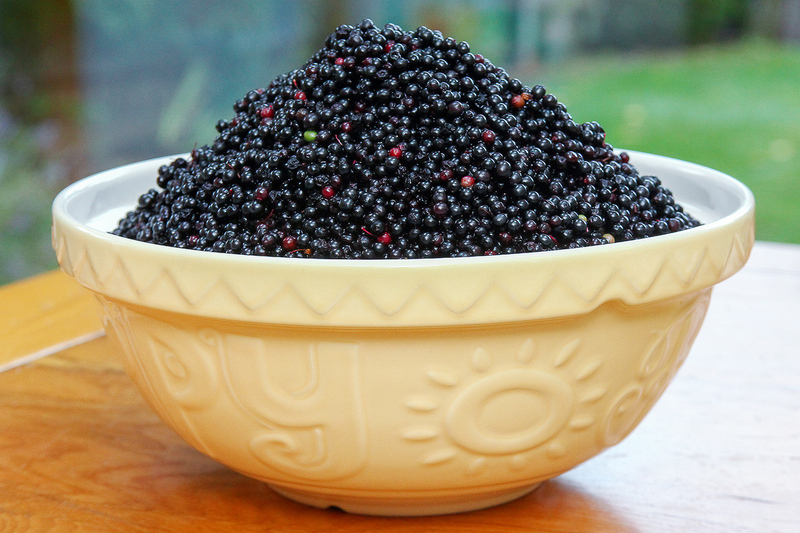 Cut off as many bunches of berries as you can that are loaded with black, ripe berries. Inevitably there will be some red or even green/yellow berries on some bunches but don’t worry about those just get as many black ones as you can. 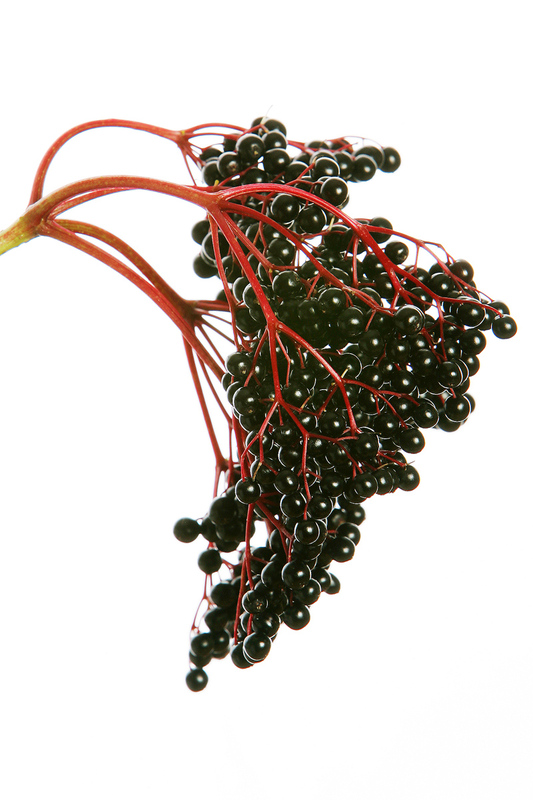 (Note: Be careful to only get elderberries and avoid deadly nightshade berries as they’re out at the same time!) If in doubt ask someone who knows or have a look at the image below to see what a bunch looks like or use Google to identify the correct berries. There will always be a few blackberry bushes around in the hedges too so make sure you munch a few of them as you go! Tip: I always try to get berries from hedges that aren’t next to main roads or cultivated fields if I can. This way you avoid pollution from car exhausts and overspray from farmers spraying their crops so you know you have berries that are as organic and chemical free as possible. Obviously this might not be possible but try your hardest to get the best berries you can. If you fill a normal size Sainsbury’s/Tesco plastic bag you should get about a couple of litres of syrup at the end depending on how juicy the berries are of course. (Try to be as eco friendly as you can with your choice of bag – use paper or at least re-usable bags if you can). This will last a while as you only need a spoonful a day – at least that’s what I have. Back at home carefully strip the black berries off the stems (the stems are toxic so don’t use them) in to a bowl. You’re bound to get a few red ones in there too – don’t worry about that, and a few bits of thin stem too which is Ok but try to minimise this. At this stage your fingers will get a bit stained as the best way to strip the berries is to gently roll them between your thumb and fingers and you’ll find that the ripe ones will roll off and can be dropped in to the bowl – most of the unripe ones will remain on the branch. Use a big bowl and then you can do this over the bowl and the berries drop straight in. When you’ve stripped the berries throw the stems away in to the green recycling bin or on a compost heap. Gently wash the berries, I do this by running a cold tap in to the bowl and the unripe berries, bits of stem, bugs etc. will usually float to the surface and can be scooped off. Don’t run the water too fast or the good berries will be washed out of the bowl too. Once washed put them in to a big pan and squash them with a potato masher. Squash as many as you can as you want all the juice out but don’t worry if you miss some as you can mash again later, as they cook, and you’ll get the rest. Some other recipes suggest using a blender for this but that might mash up the seeds inside the berries too and they can be a bit bitter – I’ve found a potato masher avoids this possibility. Bring the mashed berries to the boil using the potato masher to stir/mash the berries as they heat up. Once boiling turn off the heat. Place a piece of muslin cloth over a large bowl or two and secure with an elastic band. Gently ladle the hot berry mash on to the muslin cloth being careful not to drop the mix from a height and to spread it around evenly or the elastic band might pop off. I usually use 2 bowls and thick elastic bands and it works quite well. Leave the mash to drain through the cloth in to the bowl below, usually 30 mins to an hour. Go and play with the kids, relax in the garden or have some of the sloe gin you made last year to pass the time. Oh and clean the pan as you’ll need it later. Once drained I carefully ease off the elastic band and gather the muslin cloth up so the mash doesn’t drop in to the bowl and I can twist the cloth to hold the mash in a tight ball to squeeze out as much juice as I can. Twisting and squeezing the mash can be quite hard but really go for it and you’ll be surprised how much more juice you can get out. You worked hard to pick and process those berries so get as much out as you can! Your hands will now be covered in juice and might be a bit stained – well worth it in my view! Carefully pour all the juice in to the clean pan and put on a gentle heat. At this point a lot of recipes vary in the amount of sugar you should put in. I just put some in as the juice warms up, stir that to dissolve it and taste to see how sweet it is. Keep adding sugar until it’s right for you. Once it starts frothing on the surface of the juice turn off the heat and carefully pour in to sterilised bottles. I use all kinds of different bottles but I make sure they’re really clean and then just before I pour in the juice I boil a kettle full of water and rinse out every storage bottle with boiling water as a final clean. I’ve heard some people be a bit more cavalier with their sterilising of the bottles, or not, but I reckon cleaner is better. Make sure the bottles you’re going to store are filled to the brim, seal and keep in a cool place until use. You’re bound to have a partially full bottle as well – just drink that one first. Have a big spoonful a day and keep the bugs at bay! Now that seems like quite a long description but it’s really really simple. You don’t need any fancy kit or cooking skills and I’ve tried to add a few tips/notes from my experience as I’ve written. My 4 and 2 year old’s get involved too so have fun with it all. Have a go but if you have any questions drop me a line! Below is a compressed version, printable on one A4 page, if you copy the text and resize to 10 pt font, which might be easier to keep. Cut off as many bunches of berries as you can that are loaded with black, ripe berries. (Note: Be careful to only get elderberries and avoid deadly nightshade berries as they’re out at the same time!) If in doubt ask someone who knows or have a look at the images in this blog to see what a bunch looks like or use Google to identify the correct berries. If you fill a normal size Sainsbury’s/Tesco plastic bag you should get about a couple of litres of syrup at the end depending on how juicy the berries are of course. (Try to be as eco friendly as you can with your choice of bag – use paper or at least re-usable bags if you can). Carefully strip the black berries off the stems (the stems are toxic so don’t use them) in to a bowl. At this stage your fingers will get a bit stained as the best way to strip the berries is to gently roll them between your thumb and fingers and you’ll find that the ripe ones will roll off and can be dropped in to the bowl. Gently wash the berries in the bowl under a running cold tap and the unripe berries, bits of stem, bugs etc. will usually float to the surface and can be scooped off. Don’t run the water too fast or the good berries will be washed out of the bowl too. Once washed put them in to a big pan and squash them with a potato masher. Some other recipes suggest using a blender for this but that might mash up the seeds inside the berries too and they can be a bit bitter. Place a piece of muslin cloth over a large bowl or two and secure with an elastic band. Gently ladle the hot berry mash on to the muslin cloth. Leave the mash to drain through the cloth in to the bowl below, usually 30 mins to an hour. Clean the pan as you’ll need it later. Once drained I carefully ease off the elastic band and gather the muslin cloth up so the mash doesn’t drop in to the bowl, twist the cloth to hold the mash in a tight ball to squeeze out as much juice as I can. Carefully pour all the juice in to the clean pan and put on a gentle heat. Add sugar as the juice warms up, stir that to dissolve it and taste to see how sweet it is. Keep adding sugar until it’s right for you. Once it starts frothing on the surface of the juice turn off the heat and carefully pour in to sterilised bottles.